Although my foster home is filled with them, I am not really interested in toys. But give me a big bone and I am a contented guy. I also like to explore the back yard and can be encouraged to play a few games of fetch now and then. When I first came into rescue with As Good as Gold, my back leg was a little sore and I didn’t like to put much weight on it. The veterinarian gave me some medicine to protect the cartilage and help my joints become healthier. I was also given a non-steroidal anti-inflammatory medication for pain relief. I love pill time because they come wrapped in yummy cheese. Foster Mom doesn’t think I know her trick. I still may not be a capable running companion, but I enjoy my gentle paced walks when my Foster Mom tells me I walk with “spirit”. I even go up and down the stairs that I refused to negotiate in the past. My doctor wants me to lose some weight so there will be less stress on my joints. Unfortunately, that means no more table scraps and more green beans and carrots in my diet. 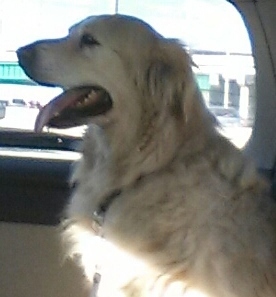 I am a calm passenger in the car even if our destination is to the veterinarian’s office. I sit contently in my place in the back seat. I get along great with a toy poodle who lives with me and even though I am much larger than she is, I am very gentle with her. I don’t bark……well, maybe occasionally at the neighbor’s cat! I am a perpetually happy guy and show my beautiful white teeth when I flash one of my big doggie smiles. All activity slows down in the evening and I look forward to settling in close to my humans. I have great manners and always patiently wait my turn for some attention when the little poodle’s turn is over. I then sleep through the night keeping watch on the household from just outside my Foster Mom’s bedroom door. Even though I know I am a golden retriever dog, my Foster Mom says I am a “dear”. No matter what you call me, I am ready to join a family who will give me lots of hugs and love me to the moon and back.